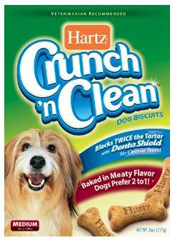 Get a FREE Sample of Crunch ‘n Clean Dog Biscuits TODAY at NOON Eastern for the first 500 people only. Trust me, these will be gone in seconds so be ready! If you miss our today Hartz will do another giveaway on September 9!